The Northern Rainbowfish was scientifically described by Weber in 1908. Its scientific name is Melanotaenia affinis. Melanotaenia affinis is sometimes confused with Melanotaenia ramuensis. This rainbowfish can reach a length of roughly 14 cm (5.5 inches). The exact colouration varies among the various geographical populations. Three of the most commonly kept varieties are called “Normal”, “Bluewater Creek” and “Pagwi”. Normal: Olive or bronze coloured back. White lower half. The prominent blue-black mid-lateral stripe is disrupted or faint on the anterior part of the body. The mid-lateral stripe expands on the tail-base and develops yellowish margins. Bluewater creek: Greenish-blue back with silvery reflections. White lower half. The mid-lateral stripe has a broad white margin on the lower edge. A disseminated bluish-black stripe runs between the mid-lateral stripe margin and the white belly. Pagwi: Sky-blue back. White or yellowish lower half. The prominent blue-black mid-lateral stripe develops orange-red margins on the posterior part of the body. A broad pale yellow stripe is present below the mid-lateral stripe. The Northern Rainbowfish inhabits streams and is found over a comparatively large part of northern New Guinea. You can for instance encounter it in the river systems of Markham, Ramu, Sepik and Memberamo. The Northern Rainbowfish is more common at lower elevations, but it is present 1500 meters (almost 5000 feet) above sea level. The typical Northern Rainbowfish habitat consists of clear streams that flow through the rainforest, but you can also find this fish in lakes and swampy environments. Specimens living in rainforest streams are used to being shaded by the dense canopies of surrounding trees. The Northern Rainbowfish is listed as “Not Evaluated” in the IUCN Red List of Threatened Species. The Northern Rainbowfish is suitable even for beginners. It can be kept in species aquariums or be combined with non-aggressive species of roughly the same size. Try to mimic the natural environment when you set up the aquarium. Keep the water temperature fairly high; around 26-28 degrees C (79-82 degrees F). The water should be alkaline, from pH 7.1 to 8.0. Feed your Northern Rainbowfish a varied and nutritious diet. You can for instance combine dry prepared foods with regular servings of live meaty food, e.g. brine shrimp and insect larvae. This species might survive on dry food only, but it will not thrive and it might dampen its beautiful colours. 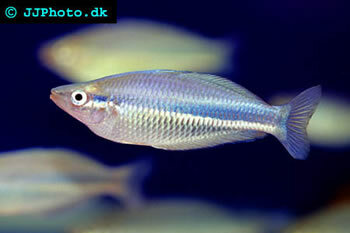 The Northern Rainbowfish has been bred both in pairs and groups in aquariums. The males can be really aggressive towards the females, and group spawnings are therefore generally safer since you can keep several females for each male, thereby dispersing the aggressiveness over several individuals. Regardless of which method you chose, plenty of hiding spots and a well decorated aquarium is strongly recommended. The Northern Rainbowfish is a prolific spawner and at least a few fry will normally survive in a well planted aquarium even if adult fish are present. If you want to promote a higher survival rate, move the spawning medium with the eggs to a separate container. The Northern Rainbowfish will readily use spawning mops and densely grown java moss as spawning medium. If you keep the water temperature in the upper part of the recommended range, the eggs will normally hatch within a week or so. You can feed the fry infusoria and finely ground flake food, until they are large enough to devour newly hatch brine shrimp and nibble on whole flakes. Do not crowd the rearing containers; it is better to cull if you have a shortage of space.